What happens when they go to college? School began a couple of weeks ago, at least for our four kids. 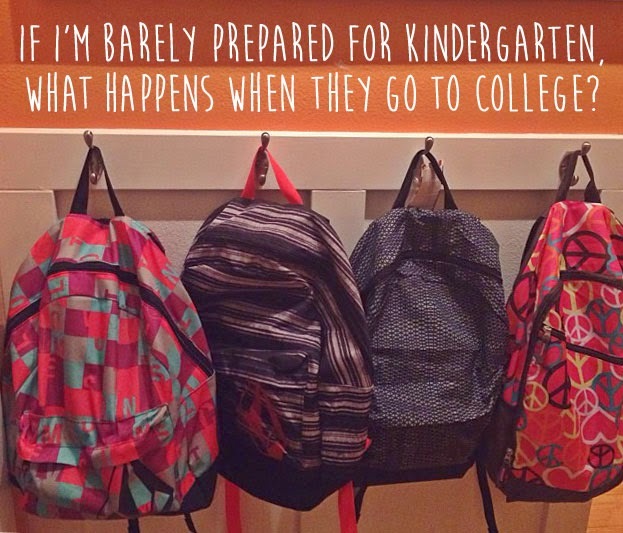 I posted about how unprepared I was for the start of the school year, especially when it came to my youngest daughter’s first day in kindergarten. It wasn’t the emotions of the day that got to me. I barely managed a tiny *sniff* as she walked into her room. I was ready for it and she was ready for it. This wasn’t a huge deal. It was all the other stuff related to school that I wasn’t ready for. Three months ago, I had an entire summer planned out for us. We had goals and ambitions, vacations, lessons, hours of unstructured time and then—boom!—the bell was ringing for the first day of school. I wasn’t ready. And I say it was more of a practical unpreparedness, but I’ll be honest: There’s something about my last little one growing up and going to kindergarten that makes me reflective. Because mentally, it’s not that hard to skip forward another decade into the future, when I’ll have kids graduating from high school and getting ready for college. My kids. In college. I wasn’t prepared for the paperwork, supplies, and tasks related to these kids entering kindergarten, 2nd grade, and 4th grade. How will I deal with them leaving high school? And then there is the financial componenet. Right now, we benefit from public school and my kids are getting an amazing education for free. What happens when these kids go to college…which costs money? Compared to all the supplies/paperwork/scheduling anxiety I had this year for their public school classes, I will instead be facing an unimaginably steep tuition price tag of thousands of dollars. I have a feeling that college will creep up on us just like the start of kindergarten creeped up on us. That we’ll just be breezing through life and then it will be right on our doorstep. That we won’t be prepared for it mentally. I have no idea how I’ll react when my oldest heads off to some university somewhere. But I do know that we’re taking steps now to prepare for it financially. Because that unimaginably steep tuition? That scares me. That’s why we opened ScholarShare College Savings accounts for our kids earlier this year. Because I know me—I know I won’t be prepared in a lot of ways—but at least this is one big thing I can do to prepare financially. As it happens, September is National College Savings Month and ScholarShare is celebrating with a big “Share Your Spirit” sweepstakes that offers a grand prize of $2500. Tomorrow is the last day to enter! All the details are here. In the meantime, I’m still filling out back-to-school paperwork. They don’t make parents do this for college classes, right?